The Cashmir motif evokes the Indian fabrics that Provencal merchants imported as early as the 16th Century. 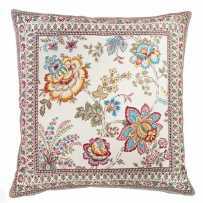 The cushion cover is part of the marvelous traditional house Marat d'Avignon which has continued the most beautiful folk drawings until today. This one seems to come straight from India. Of course not. These covers have been made in Provence, with the care taken by regional seamstresses. The Jacquard enhances this precious and rich motif, because this weaving method of French tradition is suitable for a complex decorative realization. The colors are sober and refined, for a chic home, modern or not. 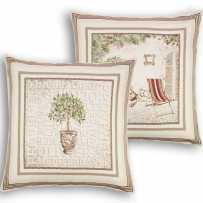 You will surely know how to integrate it in your lounge, along with a sofa throw. To complete, a choice of several items of linen is offered to you. For your tables, these are runners, table mats, tablecloths and place mats, still Jacquard woven for a very good outfit. Of course, you will find the same colors as your couch pillow covers: black, taupe or red. Please, pay attention to these colors that marry very well together and can give quite elegant associations. If you do not want color, mix gray and black for your cushion covers. The rendering will be sober without monotony for a chic interior. If you like this very royal red, then you can play alternately with the taupe gray tone: you will have a touch of very silky color for your library lounge area. Finally, you may stay on the black color, which harmonizes with all styles and all tones. Be sure to avoid any mistake of taste.